It's not just the sun you'll need to cover up from..
Sizzling temperatures will trigger intense thunderstorms in parts of the country later this week, forecasters have said. The mercury is forecast to hit 37C (98.6F) on Friday, with the possibility that the UK's all-time heat record of 38.5C (101.3F) will be broken, the Met Office said. But thunderstorm warnings are in place for parts of northern and eastern England and the Midlands for Friday, with people warned of flash flooding, lightning strikes, hail or strong winds. This could lead to flooding of homes and businesses, difficult driving conditions and potential power cuts. Paul Gundersen, chief meteorologist at the Met Office, said: "The heatwave conditions will continue across much of England, with temperatures into the mid to high-30s Celsius in many places from the Midlands eastwards on Thursday and Friday and it's possible that we could break the all-time UK record of 38.5 C if conditions all come together." The all-time UK high is 38.5C set in August 2003, while the highest recorded temperature for July is 36.7 C at Heathrow on July 1, 2015. He added: "There is the chance of thunderstorms breaking out over some eastern parts of England on Thursday, but it is Friday when we see intense thunderstorms affecting many central and eastern areas. "Whilst many places will remain dry and hot, the thunderstorms on Friday could lead to torrential downpours in places with as much as 30mm of rainfall in an hour and 60mm in 3 hours. "Large hail and strong, gusty winds are also likely and combined could lead to difficult driving conditions as a result of spray and sudden flooding." As parts of the UK continue to swelter in the heat, there were warnings that hundreds of people could die unnecessarily because of a lack of awareness of the rising risk of heatwaves. Bob Ward, policy and communications manager at the Grantham Research Institute on Climate Change and the Environment at the London School of Economics said the figure for heat-related deaths was likely to exceed 1,000 based on the extra deaths seen in short hot spells in 2016 and 2017. An amber "heat health watch" warning remains in place for parts of England, with people being warned to try to stay out of the sun between 11am and 3pm. Nurses have warned that some hospital wards have reached more than 30C (86F), leading to patients and relatives passing out or vomiting. How much water should you be drinking to ensure heatwave hydration? The Local Government Association said social workers, community wardens and maintenance staff are all on high alert to identify those who could be struggling in the heat. And pet owners have been urged to avoid exercising their dogs and other animals in the hottest parts of the day due to the risk of burnt paws on scorching pavements, as well as the chance of heatstroke. reduced to stop tracks from buckling, with trains on Chiltern Railways between London and Oxford are being rescheduled because of high track temperatures. Anglia on Monday because of the soaring temperatures. Following the driest first half of summer on record, farming leaders warned crops are being hit and livestock are having to be fed with feed that should be held for winter as grasslands are parched. The dry spell has been most prolonged in East Anglia and south-east England where the last day of very widespread rainfall was seen on May 29. Meanwhile, the heatwave has also seen a day's play lost in the India warm-up match against Essex. The fixture will now be a three-day affair following concerns about the prolonged hot weather. 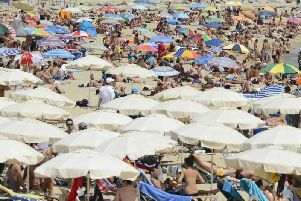 The heatwave baking Britain comes as extreme hot weather grips northern Europe, with scientists warning that the kind of conditions being seen at the moment in much of the northern hemisphere are made more likely by cliamte change. But conditions this week have been nearer normal for the time of year in Northern Ireland and western Scotland, which are seeing lower temperatures and rainy spells.